As I woke up yesterday morning time kind of stood still. I laid there for a second before calling my mom into the room to come get me out of bed, only because I was thinking about how it was that time of morning five years ago yesterday when people started catching word in finding out that one of my dearest friends, one of Claremont High School's finest alums, one of the most spirited people to attend El Roble, one of the silliest girls ever to attend Sumner elementary school, a perfect daughter, an incredible friend, and an amazing person had been taken from all of us to heaven oh to soon. Courtney Frances Stewart became one of my closest girlfriends when she started going to Sumner elementary school in the fifth grade. I can recall doing a group project with her and one of my best friends in elementary school at the time Jon Hall, where we did a report on one of the various types of snakes in the wild. Part of our presentation that we give to the class was to act out how snakes gave birth. Courtney had no problem offering up the duties of showing the class how an egg comes out of certain places, and plops onto the ground. She demonstrated this with much laughter, and I can assure you that the class followed suit as a fake white egg fell out of Courtney's pants and onto the ground mysteriously in the middle of class. It's not always stuff like this that I will remember Courtney by, but for the people around her that currently we will all remember her little giggle, two very loud laugh, her infectious smile, her blonde hair that you can see from a mile away, and that waddling walk that if all you saw was a silhouette of her you would still know it was her. Five years it's been now, and as each day goes on it gets a little easier to cope with, but never easier to forget. It's interesting how life works, how is people were so wired to be in tune, and be so appreciative of things after tragedy has struck our lives and after we have lost something that is so close to us. Whether it's figurative, literal, or even a person we tend to give life, and the people around us the attention and respect they finally deserve. Why that is? Not sure I have the answer to that question for everybody else, and at times I may even be a culprit of it myself, but I can assure you that over the past seven years since my life has drastically changed but certainly hasn't been the way I have approach things in my life. This isn't to say that my life experiences any better, any different, any worse, or any more valuable from myself and onto the next person, but the perspective that I have gained, and what I've taken away from what life has tried to teach me is a clear-cut understanding that life is short, and a true and living proof that people can truly live every moment to its fullest with appreciation and gratitude for others. Often times my overwhelming acknowledgment towards others uniqueness, positives, and beautiful traits within their personality, and incredible physical attributes as people can be misconstrued. My sincerely towards others, is sometimes interpreted as faulty, desperate, and a stretch from the truth. It may sometimes be even interpreted as sarcasm. But let me reassure you through my words and not through my mouth, so this can truly drive the point home of how everything should be interpreted that comes out of my own mouth. As some people who are close to me and that understand me have heard me say before, and have taken it literally, I will tell them it is not my job to point out somebody's false and tell them how ugly they are, or where they are lacking, but it is my job to be there for others to encourage them, motivate them, and show them that they truly are beautiful people whether they know it or not. This isn't to say that I'm out there searching for thousands of different girls, because this applies to the guys I talked to two, but merely I have found a way to find the beauty and everybody because I have a clear-cut understanding now that each and every one of us is a gift in some way, shape, or form, and all have been made a beautiful masterpiece whether we realize it or not. This is something that I have not only identified with and some of my close friends, but even with the people that I hardly even know. With all sincerity I mean this from the bottom of my heart, and when I try to reiterate to people, and tell them, and show them truly that they are a gift to this world and are beautiful in so many ways, I just hope from now on they can interpret it with much sincerely coming from Iran, and learn from it with a sense of pride and confidence that they can carry on out into the world. When I relate my own personal loss, to a loss of Courtney within my life it doesn't even compare, and that's why I have made a conscious effort the past five years, to tell those that I love around me truly what they're worth is to me, and more importantly what it means to the world. Also was a loss of Courtney, came with the loss of two others and the tragedy that would change someone else's life forever. 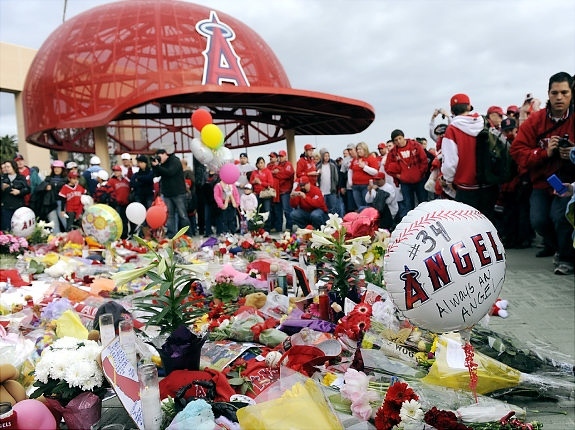 Anaheim Angels pitcher, Nick Adenhart was in the car the night Courtney passed away, when she was hit by a drunk driver heading to Incahoots, in Fullerton to go line dancing. The night of the crash, Nick had just finished playing and pitching in his first ever major league game for the Angels, at home against the Oakland Athletics, where coaches, players, family and friends, and peers who were in attendance, already were deeming him to be a potential star in the major leagues and if anything in life. But it wasn't just Nick who went with Courtney, another dear friend of both Courtney and Nick, was Henry Pearson who unfortunately came out on the losing end of the crash as well. Three incredible individuals were lost, but what we all gain was an incredible perspective, lessons learned, and sense of pride from the roots of where we came from, and how each of them will forever impact our lives until eternity. But with these three individuals forever gone from the trash, didn't mean that more loss didn't occur. The fourth passenger in the car, and the lone survivor from the accident, somebody I deemed to be a dear friend, and a role model to me now, was John Wilhite. John was an incredible athlete himself, as he still is today as he fights his own battles and demons every morning when he wakes up. John will tell you, prior to the crash, some of his most memorable moments in life, were playing in the College World Series where he got a base hit, for one of the premier baseball colleges in the country, our own Orange counties Cal State Fullerton. But it wasn't just on a baseball field where John excelled. He has and had a plethora of friends that have been nothing but support to him since the accident. And much of this might be speaking for myself but from what I have gathered, as much as John has tried to escape the spotlight of being the lone survivor, at the same time he has become a huge icon and advocate not only for the three that we all have lost, but as well as preventing in advocating for non-drunk driving acts Of responsibility within the community. John has become a symbol of hope to most all of us, and somebody we can all look at to put a smile on her face. John absolutely lives up to the acronym of hope with, hold on pain ends. And even though the pain of losing the three will never fully go away, and is imprinted on all of our hearts, John is a constant reminder that we are still left with an Angel here on earth. Whether or not you've had the chance to meet John yet, is something that am deeply sorry for if you haven't. All you can do when you are around him for obvious reasons, is just smile. He's got a clear's personality, a heart of gold, tenacity, a fiery ambition, and a will that is unprecedented. He truly is a role model whether he knows it, believes it, or even thinks he's living it or not. As she is somebody that I look up to every day, I find great joy with sharing many great times with him, as he is become even closer to me with sharing a common interest beyond just baseball, that we both love and care about. John and his family have become some of the biggest and most passionate supporters of my foundation that I have met with in the past seven years. 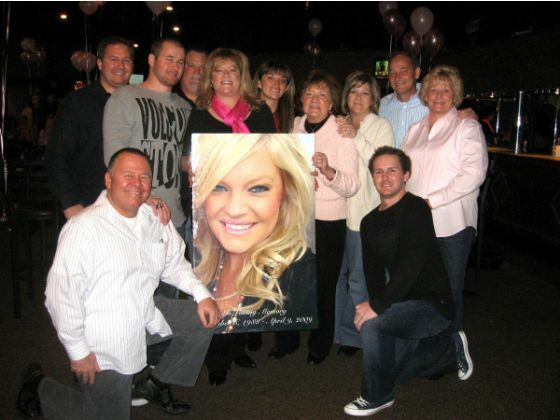 Since the crash, their family has managed to attend each event that the foundation has thrown sense, and have even gone as far to make a promise to me that they will be there every single year, simply because they love everything about it and the fact that it brings all of us together regardless of circumstances. Now what I haven't told you, is the fact that John is a miracle in himself. In the accident, John had received what was deemed as an internal decapitation of the head from the spine at the C1 level. This is something that nearly every single individual dies from, let alone ever walk again. I can assure you no matter how many stories you have ever heard, you will never hear anything like this. John has managed to not only recover from his injury and be alive, but he is also a walking testament that miracles can and do happen. The fact alone that he can walk up to me every time I see him and get me a hug, emulates the same feeling that I used to get when I would hug Courtney. As I texted John yesterday, to remind him that he is always in my thoughts and prayers, beyond just what yesterday signified to him and me and so many others, but our conversation ended with me doing what I do to most anybody that holds a true spot in my heart. I reminded him how great of a person he truly was, not out of pity, but out of pure sincerity. Doing what John always does, he flipped it back and threw it right back at me by saying that I was one of his heroes as well. I guess I have a clear-cut understanding now of why I have chosen to surround myself with somebody like him. He's a perfect angel.. so as each day goes by, nothing will bring back, Carrie's Courtney, my Courtney, our Courtney, our Nick Adenhart, or our Henry Pearson, but will always remain is the imprint that they left on our hearts and the angel that we are left with here on earth. And as much as things are taught in life, that we never really retain and never really learned, we can all gain a huge perspective from this and an even bigger lesson learned was something that true facts can backup. The facts are: every 15 minutes somebody is killed by a drunk driver. Drunk driving is an accident, it's a choice, and it's murder. Every 48 seconds, a drunk driver puts somebody like me, and somebody like John, into one of those handicap spots at the front of Von's that we all vie for. But what really matters from all of this, is the fact that we all still have hope, and we all still have a chance to change the world, but what will you do with that chance? Will you try to teach and provide perspective to others? Or will you sit back and not be an advocate and let a dear friend make that dumb decision that could be life-changing. Speak up, it only takes one voice to change the world, and one moment to change a life. So sincerely I will leave you with this as I hope you all take away a newfound perspective to do the same to others, do yourself a favor today and lay in bed tonight and try a few things. Sit up in bed, stretch your hands over your head, reach over and grab that glass of water beside your bed, then get up and go to the bathroom, then go lay back down and realize how fortunate you are to still be here. What does that mean to you? Because to Courtney, Nick, and Henry, they will never be able to do that again. And then think about how you just did something that John struggles every single day to do and will for the rest of his life. Are you living your life the way you should, and to its fullest? Only you can determine that. Never forget to say I love you only so you can hear, the words of an angel and what she would say back, " I love you more..." never forget 4/9/09........ and never forget the words that I spoke at Courtney's (MY COWGIRL) funeral as I gave part of her eulogy because it emulated to a T who she was as a person: " worry more about your character than your reputation, your character is who you are and your reputation is merely what others think of you.., and to be perfect........."
Older PostThe moving week of January 20-26!